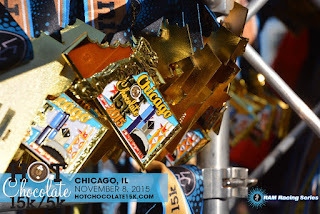 One of my goals before moving to FL was to run a race in downtown Chicago, I had initially thought about running the Rock 'n Roll Half Marathon but saw the Hot Chocolate 15k and was instantly attracted to it. 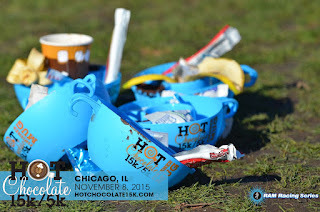 What could go wrong at a race distance I had never run before, in the middle of a city, that had hot chocolate and fondue as one of the perks? The expo was awesome! I attended the expo on Saturday November 7th and was blown away by the amount of people and vendors present. The bib pick up and jacket pick up was extremely simple and organized. It took my mom and I about 10 minutes to get our bibs and jackets, with some of those 10 minutes being spent grabbing samples of hot chocolate and marshmallows. The jacket that you receive with your race registration is extremely soft and has become one of my lounge staples. I only bought some headbands from Sparkly Soul and debated about getting a car magnet but was too undecided to pick just one. My New Sparkly Soul Headbands! As you can see from the pictures of my expo swag below, I made out like a bandit and enjoyed every minute of it! If you can see it in the picture of my jacket there's a cute blue/grey racing buff. I received this buff because I used a code from one the Hot Chocolate ambassadors. Hopefully one day I'll be able to share a fun code with my readers. A Jacket, Bag, and Buff! Major Win! During the expo there were various picture opportunities set up, because I was with my mom I decided to not push the issue about taking a ton of pictures and just took one with my bib. The morning of the race got off to an extremely early start. The night before I had stayed at my uncles house along the Blue Line and had a much shorter commute than I would have had if I had stayed at home. The access to this closer house was greatly appreciated, but I still had to get up a dark o'thirty and function on a fairly normal level. My dad was kind enough to drive my mom and I to Grant Park so we didn't have to take the el, and we got there much earlier than planned. Just after he dropped us off we realized that my mom had left her phone in the car. Because of the amount of people that would be here we needed her phone for connecting after the race and spent a good 15 minutes getting my dad to turn the car around and deliver the phone. Once the phone had been retrieved we separated because she would be participating in the 5k and I had elected to run the 15k. These two events are split for the start and the signage to get to our respective corrals was impressive. At no point did I feel like I was lost or confused. 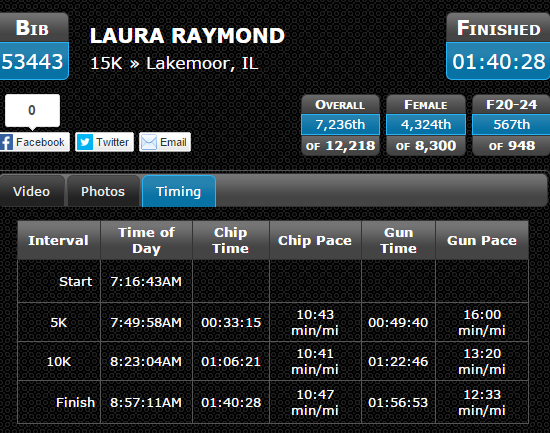 The split for the 15K and 5K. 15K on the left, 5K on the right. 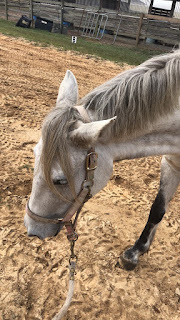 I quickly found my corral and a was happy to see that it was by a grassy area to stretch. I had submitted a proof of time from the Crystal Lake Half Marathon and was happy to see that I was placed in a "preferred corral" for this race. When I entered my corral I found the people that were with me to be extremely friendly. There were a few ladies in my corral with the same leggings and we had a good laugh over cheap, yet cute leggings from Kohls. While I was setting up my tracker and music I heard my name being called by a familiar voice. Much to my excitement some of my friends from Running Depot had been placed in the same corral. We were lucky enough to get a picture together from the official photographer. Once the race started I stayed with my friends for a bit, but we ended up splitting up. I was trying to PR and they were just planning on having fun. The race weaves on Lower Wacker for a bit and despite fearing this section I actually found it easy. There was a strong presence of race officials and police so I never felt uncomfortable, plus the street was clean and easy to navigate. There was a slight smell to the area but it wasn't as bad as it could have been. Once we were out of Lower Wacker the rest of the race was "above ground". I found the course well marked, and well staffed. During the first three miles I seriously debated dropping down the 5K course but knew that if I did I would really regret my decision. During these first three miles I dropped my water belt, had my music glitch, and my fitbit tracker was completely off. It was insisting that I was running 6 minute miles. The 5k course and the 15k course stay together until about mile 2.5 and then they split. I've heard stories from other runners about how they accidentally jumped on the wrong course but I have no idea how that could have happened. This course was extremely well marked out and there were a ton of volunteers making sure that the runners stayed on the correct course. Past the 15K/5K split I found the race became easier. The crowd thinned out and I was able to focus more on running my race and not trying to "show off". During this section of the race I found myself focusing more on the scenery and less on maintaining my pace. Because I was running through sections of the city that I don't normally experience, I decided that it was perfectly alright to just enjoy the course. 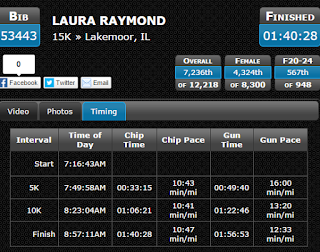 The only part of the course that I did not enjoy was the section through McCormick Place. This area does get dark, like pitch black, dark. So I ended up turning off my music and slowing down. I figured that any lost time would be worth it, the last thing I wanted to do was trip and injure myself. Once I had finished this section I felt like I had won. The majority of the race was over and I felt super accomplished. The final section was fairly hilly but I honestly didn't find them too bad. These hills were steep and a bit twisty but they were manageable. Running into the finish felt amazing, there was a huge crowd along the course cheering the runners on, and the atmosphere was awesome. Everyone was so festive and excited. Once I crossed the finish line I was instantly impressed with the organization. Like the 15K/5K split earlier the finish was divided because the 15K runners were receiving medals and the 5K runners did not. I quickly received my medal and then found the water/sports drinks immediately. The volunteers working the hydration station were extremely generous and handed me two water bottles even though I asked for one. I also quickly found the medical tent, with a very short line, and debated about getting ice but decided against it. After the finish I followed the crowd to the finish line party. Holy moley was the race party crowded. It was literally a mob of people, but also surprisingly organized. There were alphabetical signs around the party for people to meet up with their parties. After my mom texted me saying that she was at the party we quickly found each other. Once we found each other we wandered through the merchandise tent, and got our hot chocolate and fondue. The hot chocolate was the perfect temperature for me and the fondue was a fun reward for finishing the race. 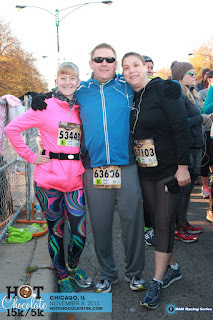 Overall, I loved the Hot Chocolate 15k and would run it again with no hesitation. My only complaint is that I am moving to Orlando and am going to have to drive up to Atlanta to run the race next year. I'm hoping that because Orlando is listed as a "notify me" on the Hot Chocolate website the race will one day come to my home! If it does then I can guarantee that I will be running it! Pros: Great swag, super organized, fun post race party, awesome medal, great atmosphere. Cons: Waking up a dark o'thirty, there isn't an Orlando race yet. 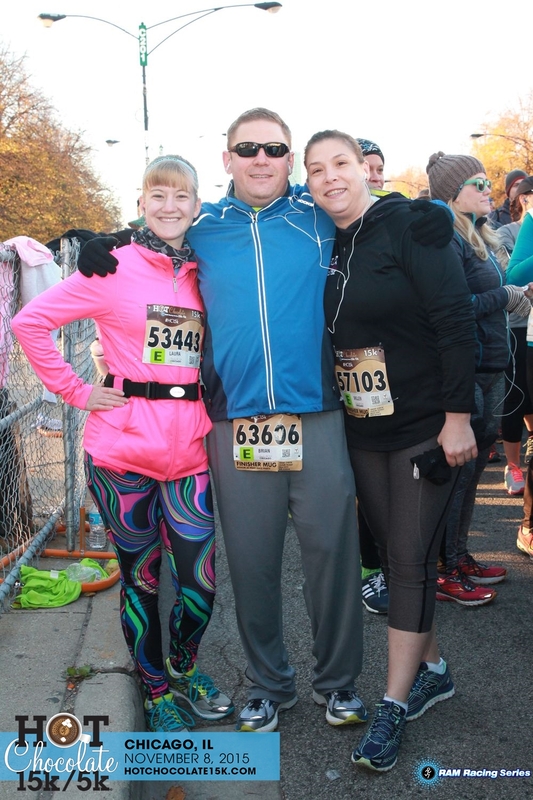 As a quick side note, I wore my new Sparkly Soul "Run Chicago" headband during this race and kept feeling it to make sure that I still had it. That headband did not move at all during the race, or after the race while I was at lunch. It gripped my hair perfectly, but did not leave a dent or snag my hair at all. Plus, I love that I now have a headband to honor my hometown! Sparkly Soul is definitely going to be my headband of choice during my next races.